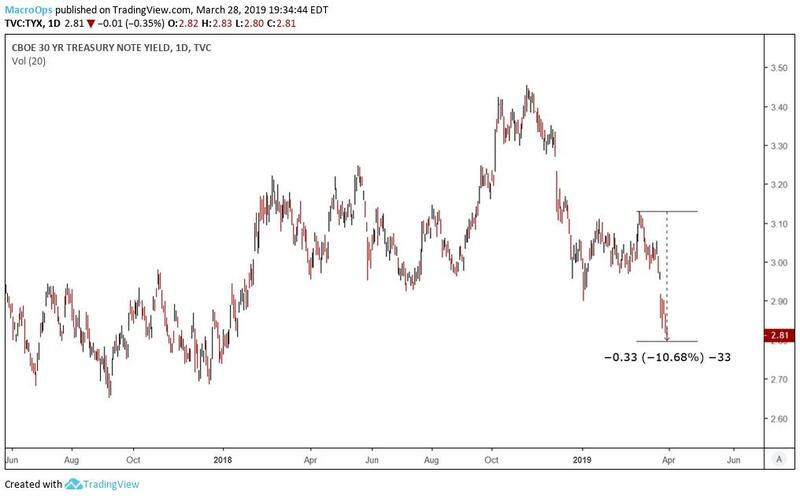 A Tactical Short In Rates — Find out why Alex thinks a tactical short in bonds or utilities could score nicely in the next few weeks. Anchors Away: My Three Favorite Shipping Ideas — Our new deep value guy, Mr. Bean, reveals his favorite shipping stocks for 2019. A Golden Macro Opportunity — Alex breaks down the drivers of the price of gold and explains why a HUGE move is on the horizon. There’s A Big Macro Move Brewing In Markets — A review of a Druck trading maxim totis porcis and why it might be time to whip out the hog soon in FX. Yield Curve Inversion: Why This Time Is Different — Confused as to what the inverted yield curve means for global markets? Check this out, Alex explains why it’s not time to run for the hills and go to cash yet. US rates have gotten killed. Below is a chart of the US 30-year rate which now sits at 2.81%. Going into the beginning of the year, bond volatility had been sold into the ground because everyone felt that the Fed was in a holding pattern for the rest of the year. But the surprise dovish announcement on March 20th completely derailed that narrative causing rates to break out of their range. All the traders that sold options, betting that rates would stay range bound, needed to cover their losses quickly causing additional momentum out of the range. Behavioral — An investor exercising remarkable control over his emotions so he does not fall prey to the extreme pessimism and optimism of the crowd. Analytical — An investor who can synthesize and interpret public information better than the rest of the market collective. Informational — An investor who has access to information that other market participants do not have. Technical — Arbitrage opportunities within the market microstructure. If your a fan of investing process and meta-process like me be sure to add this to your queue this week. Before this interview I had no idea that Jim Simons actually had a background in fundamental discretionary currency trading. He mentions that his performance was good but he couldn’t handle the ups and downs that come with a discretionary approach. One day he would walk into the office with his positions in the green and feel like he’s a genius. And the next day everything would reverse and he would feel like an idiot. The emotional gyrations wore on him which is why he decided to go full out systematic. With a system he simply did what the computer told him to do. This speaks to the importance of knowing yourself inside and out if you want to have long-term success in the market. Some people need a system, others thrive with flexibility. The key is dabbling around on small size until you find out what works for you. The NY Fed’s recession model is forecasting a 29% likelihood of a recession hitting the US within a year. 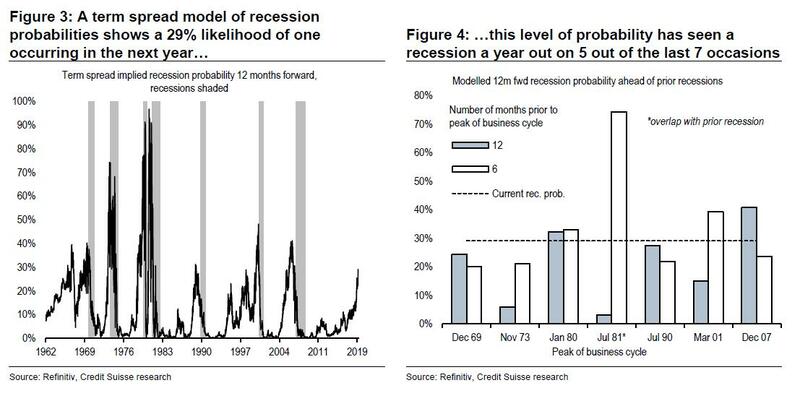 Credit Suisse says when the Fed’s model goes up to 29% there is actually a 71% chance of a recession hitting within a year. The Credit Suisse number looks a little curve fit to me… Our base case is for recession well into the future. But we’ll keep a watch on the NY Fed’s model to see how the probabilities develop. Market’s follow a 90/10 distribution meaning only a few move moves will make your bottom line each year. It’s key to stay in the game and follow and sound process through all the false moves while you wait for the real one.